This portfolio created by Andy Warhol contains eight screen prints on Lenox Museum Board of different variations of camouflage. Camouflage gave Andy Warhol the opportunity to work with bot an abstract pattern and an immediately recognizable image, rich in associations. 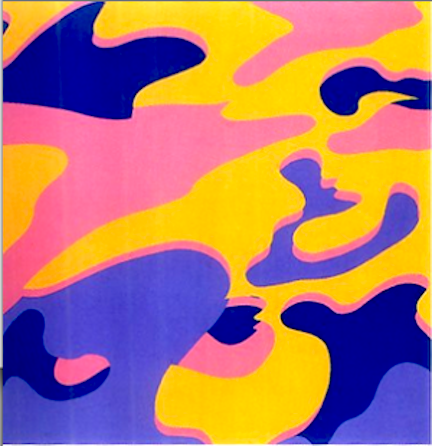 Unlike military motifs, Andy Warhol’s camouflage paintings reflect bright synthetic and inorganic colors, which would not provide a veil or disguise in any landscape. Warhol’s Camouflage paintings reflect bright synthetic and inorganic colors, which would not provide a veil or disguise in any landscape. Created by artists at the military’s request, camouflage dates from the early 20th century. It was first used for concealment of equipment, and then for uniforms. As Warhol invented more camouflage works he incorporated the pattern into his self-portraits. In these works, the juxtaposition of identity and disguise mirrors the artist’s lifelong struggle to gain notoriety while keeping his own private life hidden. Warhol also collaborated with the fashion designer Stephen Sprouse to create a line of camouflage clothing. This apparel brought the association of war into high fashion: women dressed in camouflage gowns did not blend in, but instead attracted attention in urban settings.